And once again, the sumo caravan of two hundred forty people, of whom more than one hundred are rikishi, has hit the road! From August 3rd to 20th, the convoy criss-crossed the northern part of Japan, making a round trip of seventeen stages between the regions of Kanto and Hokkaido, and passing through Tohoku. This jungyo was supposed to be notable for the presence of two Yokozuna, Asashoryu and Hakuho, after the former reasserted his authority by winning the Nagoya basho. But it wasn't to be: committing one of those blunders that only he can explain, Asashoryu bowed out; the resulting fallout is well known (see our articles in this issue and in Le Monde Du Sumo #23). Nevertheless, the Nagoya tournament delivered a divine surprise in the performance of Kotomitsuki. His promotion to Ozeki on the day before the jungyo came at just the right time to rejuvenate the Japanese fans who were able to cheer on one of their compatriots. The atmosphere was, therefore, not particularly spoiled by Asashoryu's defection as our rikishi departed to delight the crowds. Other absences of note included the Ozeki Kaio and the young Tochiozan, both recovering from injuries suffered in the Nagoya basho. 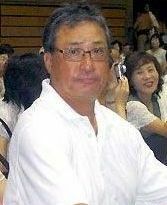 A certain uneasiness hovered over the first stage of the summer jungyo: what would be the consequence of Asashoryu's absence? The NSK, through Oshima Oyakata, took matters in hand to limit the potential damage. In the morning, the jungyo director spoke in front of the rikishi, exhorting them to make all necessary effort to alleviate the absence of one of the main leaders: "It's very important to not distinguish between the official tournaments and the jungyo. Asashoryu isn't here and I therefore hope that you put all your energy into this jungyo." Without delay, some wrestlers, most notably Ama, Kotomitsuki, Takamisakari and Kitazakura, put themselves to the task and made themselves available for an 8 a.m. meeting of dedications and handshakes. Among the fans, there was, of course, disappointment, but also some agreement with the punishment doled out to Asashoryu ("These sanctions are there to allow the rules to be respected.") 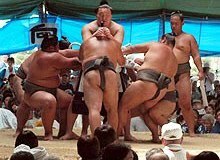 The director of the executive committee of the Tomioka basho expressed the common opinion: "The countryside is the base for the popularity of professional sumo, so these shameful dealings of the Yokozuna are truly regrettable. 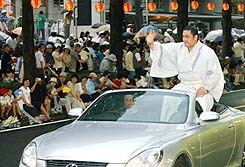 However, although Asashoryu did not come, the fans are very happy." With close to 2300 spectators and almost a full house, the return of the rikishi to Tomioka after an eight-year absence went well, and Oshima Oyakata was able to feel a sense of relief and satisfaction with his troops. On the dohyo, Kotomitsuki inaugurated his rank of Ozeki ("Everything is different as of now"), and did so with honor. Cheered on by the fans, amidst a heat that seemed difficult to handle, he had thirteen matches in a row, against Ama and Toyonoshima among others, delivering skillful dashinage. Concerning the Asashoryu affair, he commented that he had been surprised by the severity of the punishment, having expected only that Asashoryu's salary would be reduced. 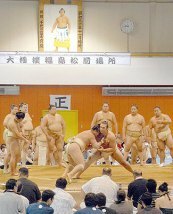 Hakuho had already had the time to get accustomed to his tsuna, but it was nevertheless his first jungyo as a Yokozuna and he was conscious of maintaining the dignity of his rank, all the while regretting the absence of his colleague Asashoryu (" I was looking forward to being on the dohyo with the yokozuna. I am very saddened by his suspension"). He was very active in the operation of seducing the public, performing in particular a demonstration of tsunashime (tying of the tsuna). He offered the fans one of the most vigorous training sessions together with Kotomitsuki, as well as twelve matches during which he, without mercy, threw out Kisenosato, who had just had a brilliant Nagoya basho. 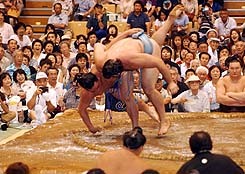 The jungyo are a chance to see rare matches (bangai torikumi) that the rules of sumo make almost impossible during official tournaments: matches between wrestlers from the same heya. In Sendai, where the wrestlers hadn't visited in six years, the 5000 fans who came to the second day of the jungyo were able to see a matchup between the two Ozeki of Sadogatake beya, Kotomitsuki and Kotooshu. The Japanese wrestler clearly won in the applause department, as well as on the dohyo, where he defeated the Bulgarian with a remarkable uwatenage. The two men were pumped up for this matchup, created by the NSK as part of its seduction plan. For the first Sunday event, the summer jungyo stopped in Morioka. It was the first time in four years for this city and the first in two years for Iwate prefecture. In the previous visit, the jungyo was hosted by the city of Kuji, the hometown of Tochinohana (juryo, Kasugano) and Yotsuguruma (makushita, Isenoumi). The day before, Morioka had celebrated several of its local-born rikishi (editor's note: during a jungyo, the wrestlers from the region often attract more fans than the best of the banzuke). Tochinohana and Takamisakari, from the neighboring prefecture of Aomori, as well as Homasho and Kisenosato, traveled the main artery of the city in a convertible, under an intermittent drizzle which discouraged no one. 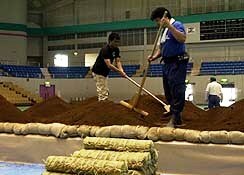 In order to provide a dignified setting for the matches, a dohyo had been set up in the Morioka public skating rink. This required fourteen tons of red soil. This soil had been set out to dry since the beginning of July and the best portion had then been selected. The small, circular bundles of straw which make up the tawara had also been produced in Morioka. Kotomitsuki and Kotooshu went up against each other again to the great delight of the fans who also expressed a warm welcome to the local-born wrestlers, the above-mentioned Tochinohana and Yotsuguruma as well as Kachimori (makushita, Isenoumi) and Kumagai (jonidan, Isenoumi). About twenty student-rikishi from the prefecture were also at the event and it was toward their dear Takamisakari that they focused their efforts. The city of Fukauramachi, in Aomori prefecture, hosted the fourth day of the jungyo. Happy Fukauramachi which, in a feat unprecedented in the history of sumo, saw four local sekitori move up the ranks at the same time: the brothers Aminishiki and Asofuji (sekiwake and juryo, respectively, Ajigawa), Kaiho (maegashira, Hakkaku) and Masatsukasa (juryo, Irumagawa). All four used to train at the dojo "Tenshinkan" where, that day, nine students were able to measure themselves against their glorious elders. 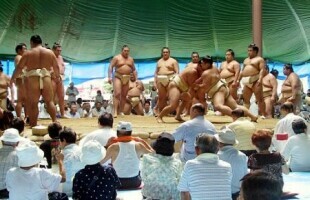 In total, nine rikishi from Aomori prefecture were present. Two thousand five hundred people took their places in the building set up for the occasion, reserving of course applause and cheers for the "little guys" of the neighborhood, who in turn were delighted to offer a great show to their fans. The following day, in Fukushima, located on the southern coast of Hokkaido, the rikishi inaugurated the six-day series which was to take place on the northern island of Japan. The first stage - oh how symbolic! - because Fukushima, which hadn't seen a jungyo in fifteen years, is the birthplace of two yokozuna: Chiyonoyama the 41st and Chiyonofuji the 58th yokozuna (current Kokonoe Oyakata). The place had earned the nickname "yokozuna no sato" (the birthplace of yokozuna) and boasts a museum of yokozuna. It was in the municipal gymnasium where, under the gaze of Chiyonofuji's portrait, the rikishi treated the fans to training sessions and matches, doubling once again their efforts, and with success, to erase ill feelings towards Asashoryu. But the jungyo are much more than sweating guys on a dohyo, and between matches, starting from the early hours of the morning, the public was able to watch "shokkiri " (comic parody of matches) and to hear "sumo jinku" (sumo songs). From the beginning, this Natsu jungyo took on the look of "Operation seduction and pardon". In Yubari, the passage of the rikishi took on another dimension. Following the closing of the last coal mine in 1990 and the failed attempt at converting the local industry to tourism, the region experienced severe economic difficulties, and the city had basically declared itself bankrupt; its finances are now under the jurisdiction of the Japanese government. In this situation, the NSK, for the first time since 1990, decided to completely cover the expenses of the day, approximately 5 million yen (30,000 euros), and to not charge for the seats. 1500 people thus came to the culturo-sportive center of the city to see the wrestlers on tour for free. Yubari has a very strong sumo tradition. In the past, the city produced four makuuchi rikishi (Daisetsu, Miyagino, maegashira 3, born in 1944, active from 1962 to 1973; Chibanoyama, Miyagino, maegashira 6, born 1945, active from 1962 to 1970; Asanobori, Asahiyama, maegashira 2, born 1948, active from 1963 to 1978; and Kinoarashi, Oshiogawa, maegashira 2, born 1961, active from 1977 to 1991). During the prosperous years, each coal mine had its own sumo club, but notwithstanding its reversal of fortune, the city remains very dynamic in the sumo world. In an exceptional feat, despite the general availability of the rikishi from the beginning of this jungyo, starting at 9:30 all the sekitori were lined up at the entrance to the building for a session of handshakes, autographs and photos. Hakuho, also present with his colleagues, declared: "We are delighted to be able to bring some comfort to all these people". On a more personal note, he added: "I'm going to bring back some melons (ed. note: Yubari specialty) to my wife". Oshima Oyakata, hailing from Hokkaido, did not hide his joy: "Isn't it the first time that the sekitori are all together like this?" Before the matches, thirteen high-school and college students from the local sumo club were able, under the enthusiastic applause of the crowd, to size themselves up against the professionals. As usual, they were impressed and surprised by the size of the wrestlers whom they saw for the first time "for real". During the seventh stage of the jungyo, Otsukasa (juryo, Irumagawa) lent his massive silhouette to the promotion of road safety. This initiative was in response to the request for collaboration made to the NSK by the police of the city of Shintoku. Otsukasa installed himself on Route 274, near the place where the basho was taking place that day. Wearing a mawashi and displaying a flag with the words "slow down", the rikishi echoed caution to the speeders. He admitted feeling a bit ill at ease but was reassured by the smiles of the drivers. As for sumo, Hakuho reinforced his image of "responsible Yokozuna", on which the NSK relies heavily to counterbalance the fallout from Asashoryu. 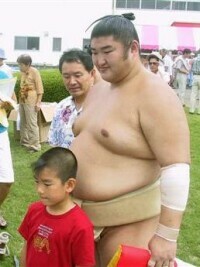 The young Yokozuna preached the good word: "I really like the jungyo. The children who come to see us are the future. Maybe some of them might become rikishi". On the dohyo as well, Hakuho showed his professional side. During the training, the 2000 fans were able to see him go all out against Kotomitsuki whom he crushed by 8 wins against 2 losses. Furthermore, all the rikishi dedicated themselves daily to these training sessions and Oshima Oyakata was in heaven: "Hakuho pulls everyone to the next level, and brings a real dynamism!" On the subject of Asashoryu, he "already forgot everything". Asahikawa, the ninth stage of the summer tour, is located in the center of Hokkaido and is one of two cities on the island with the same name. It is no accident that the rikishi stopped there this summer: Asahikawa is also the birthplace of Kitanofuji, the 52nd Yokozuna, and currently the sumo commentator for NHK. Kitanofuji entered sumo in 1957 and it was thus, to celebrate his golden jubilee, that this day had been organized. Before about six hundred people, Hakuho once again displayed all his energy, notably against Kotomitsuki, with whom he had ten training matches (sanban-geiko). He earned the admiration of Kitanofuji: "You really get the sense that Hakuho is going into this jungyo as the leader." The former Yokozuna Kitanofuji naturally also expressed his thoughts on the "Asashoryu affair" and called into question the attitude of Takasago Oyakata: "What I don't understand is why, the day after the images of the soccer match were shown on TV, Takasago didn't call Asashoryu. If he had made him come back to Japan and had immediately organized a meeting for him to apologize, things would not have become like this!". One might recall that as a Yokozuna (Kokonoe-beya, of the Takasago ichimon), Kitanofuji experienced a similar misfortune. In 1972, he had bowed out of the Nagoya basho for health reasons. Alas, a little later, some photographs showed him surfing in Hawaii and the NSK issued him a warning. However, contrary to the Asashoryu situation, he immediately returned to Japan, participated in the summer jungyo and won a zensho yusho in the following Aki basho. Elsewhere, another incident arose, although, fortunately, without serious consequences. Kasugao (maegashira, Kasugano) became the victim of dehydration and had to be transported to the hospital. First of all, for Kasugao, it was more a case of worry than of anything bad, as he apparently came back quickly from his dehydration and got up on the dohyo at the Tsukisamu Green Dome in Sapporo: "I received good care and I feel much better." Once again, Hakuho grabbed the attention of the fans. During the training sessions, he had twelve consecutive bouts, five of which were against Homasho. 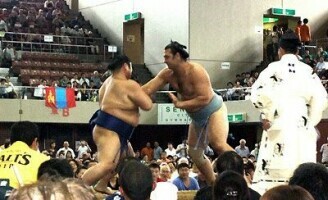 However, the Yokozuna was not satisfied with his sumo: "Homasho put in all his power. Myself, I was inadequate." That Sunday in Sapporo also marked the end of the rikishi's stay in Hokkaido, which Hakuho put in a positive light, from many points of view: "It was difficult getting around, but I'm happy about the training. And I also ate well!" After a day of rest, the members of the summer jungyo returned to the main island of Japan. The homeboy of this stage was Takekaze. The night before, he took advantage of the day of rest and went to his birthplace of Kitaakita with Yoshikaze, his colleague from Oguruma beya, visiting a senior's home for the handicapped. 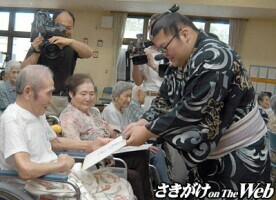 Among the residents were many sumo fans who had expressed the wish to meet some rikishi. In the presence of about sixty retirees who came together just for the occasion, the maegashira shook hands, signed autographs and answered several questions: "Where does your shikona come from?" Takekaze: "It expresses my hope to perform a sumo full of force, like a powerful wind" (editor's note: the idea of force is expressed by the first character of his shikona, which is read "take") Yoshikaze: "I received my name from my late grandfather." The next day, Tuesday, August 14th, the Jukai Dome in the city of Odate welcomed the rikishi for the third time since 1999. Before 3500 people, Takekaze once again stepped forward. After the tsunashime demonstration by Hakuho, the local boy together with the indefatigable Takamisakari and Kitazakura, provoked much laughter from the public with their usual antics against about thirty secondary school and college students of the region. 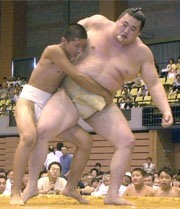 One of them, aged twelve, who went up against Kitazakura, declared: "The sekitori is so strong, I couldn't even move!" 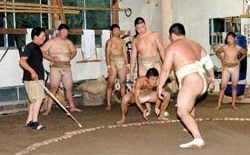 This 14th of August also witnessed the return to the dohyo of Kaio, injured in the left thigh during the Nagoya basho. Although still feeling a light residual pain, he was delighted to put his mawashi back on, even though he had no matches: "The simple feat of getting up on the dohyo is a re-education for my leg". The return of the popular Ozeki served also to delight the fans as well as Oshima Oyakata. On Tuesday, August 14th, at 6:19 in the evening, in a hospital in Matsudo, Chiba prefecture, near Tokyo, Kotozakura, the 53rd Yokozuna passed away at the age of 66. Although still very present among his deshi, he had officially retired from his function as Oyakata of the Sadogatake beya in November 2005, the time of the promotion of Kotooshu to the rank of Ozeki. More recently it was Kotomitsuki who brought him the same good fortune. The wrestlers learned the news in the bus which was taking them from Odate to Sakata. It was, therefore, with a heavy heart that the two Ozeki, as well as Kotoshogiku, participated in the twelfth day of the jungyo. Nevertheless, they remained available to the public and battled each other, as had become routine since the start of the jungyo. No joy accompanied Kotooshu's victory by yorikiri, and neither rikishi had much to say. Oshima Oyakata paid them homage: "Both of them received a great shock. But they took it on themselves to continue to do their best." It had been four years since the NSK stopped in Yamagata prefecture, and in the gymnasium in Sakata, the crowd numbered more than 3000. After Otsukasa, it was four rikishi from Azumazeki-beya who took on the public relations duties. Profiting from the temporary residence of the heya in Oguni, the local associations for the promotion of road safety and of the fight against crime asked them for a helping hand. Thus, Kubota, Kosei, Takamiryu (sandanme) and Waki (jonidan) showed up in a shopping center in Oguni in order to make the customers aware of the problems related to security. On the dohyo in the gymnasium in Higashime, it was another wrestler from Azumazeki beya who delighted the fans: the very popular Takamisakari scrupulously reproduced all the gestures which had made him so popular with the public. As for Hakuho, he put together eleven training matches against Kisenosato, who will be back in Sanyaku for the Aki basho. The region of Niigata is recovering from the earthquake of July 16th. The whole package of services put together for this jungyo in order to "apologize to the public" following Asashoryu's absence, therefore, took on a special value. From the morning, one group of rikishi, among whom was the locally-born Shimootori (juryo, Tokitsukaze), was at the entrance to the Niigata municipal gymnasium to welcome the fans. On the dohyo, Kotomitsuki and Ama were particularly visible, but Hakuho also, as the day before, had an intense training session against a revitalized Kisenosato. The promoters of that day's events could therefore again be satisfied: "We were expecting half the maximum capacity of the gymnasium (3800). But at the last moment, our expectations were surpassed." In the end, there were 2300 people who came to cheer on the rikishi. Kotooshu allowed himself a few words to the press on the subject of the death of Kotozakura: "I can't believe it! I was able to become Ozeki thanks to his methods of another generation. What I will always keep in my memory is his severe look during the training. I think of him as my Japanese father." Thanks to the sponsorship of Shinano Mainichi Shimbun, the biggest daily newspaper of the region of Nagano, the first day of the last weekend of the jungyo brought the rikishi to Matsumoto after an eight-year absence. Five thousand fans were in attendance. Good fortune was with them because Kaio had his first matches of the jungyo. He announced his participation in the Aki basho but remained cautious: "Until the week before the basho I want to give priority to my treatment." Kyokunankai (juryo, Oshima) was the selected opponent of the Ozeki for the day, for a total of fourteen matches. He ended up on the knees of his Oyakata who only mildly appreciated seeing his shirt covered in mud. "The Ozeki is so energetic that I was thrown onto my Oyakata as if I had been blown off! ", mumbled the hapless sekitori. Recovering as they were from the July earthquake (200 injured and homeless), the people of Joetsu could only offer wry smiles to the "stress" of Asashoryu and many disapproving voices could be heard in the region, which hadn't seen a jungyo in five years. "It wasn't just Kashiwazaki that suffered, Joetsu was also damaged! It's really too bad that Asashoryu wasn't able to be here! But thanks to all the other rikishi, the victims will be able to have a brief respite", declared a business leader of the region. In fact, almost all the 4600 seats were taken in the Region Plaza, where the cheers went towards Shimootori: "My parents' house is about a 20-minute ride from here." Also on the dohyo was Chiyohakuho (juryo, Kokonoe), absent from the matches up to this point. At the end, special tegata were put up for sale. Time to take stock on this last day of the jungyo. Thumbs up, for an overjoyed Oshima Oyakata: "The crowds were bigger than we had expected. We often had a full house." 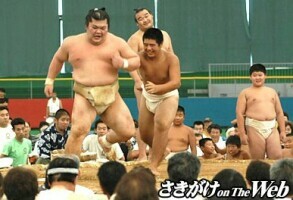 In fact, the NSK had made an effort to reverse the loss in popularity of sumo in recent years. By reducing certain costs, the NSK was able to lengthen the jungyo by five days, compared to the previous year. An emphasis had also been placed on advertising and on distribution of the tickets. What about the effects of the Asashoryu affair? It would seem the effects were rather beneficial. 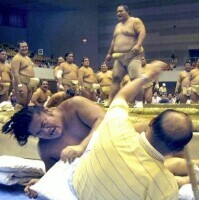 By requiring the NSK to improve its services to the public, by bringing a higher level of media interest in the jungyo - even if the national press gave it little coverage - and by motivating the other wrestlers, not all of whom approved of the Yokozuna's attitude: "In my heya, if you do that you're fired! ", "No one is sympathetic, it's indefensible." Day after day, they tirelessly played up their ties to the public. Hakuho, the resident Yokozuna, hardly missed a single training session. A ray of hope in a dark period?